The BMW is likely to be available with some power under the hood unlike the 124 with the huff-and-puff-but-do-little Abarth treatment. The fully optioned Abarth yes is likely to cost less than a base Z4 (ridiculously overpriced), but it's still the mediocre Fiata when all is said and done. For the price of a base Z4, I'd go with the Mustang GT convertible which has far better styling, infinitely better power, and excellent handling. There simply is no reason that a Z4 should cost as much as it does and given its terrible sales volume, people have voted with their wallets by going elsewhere. Most likely they see too little for too much. I fuzlly agree that the Mustang is hardto beat at bang for buck, and in general can compete with serious sports coupes and sports cars, but i was thinking more of small 2 seat convertibles, and as the market is limited, the Fiata comes up somehow, especially as it does look larger than the toyish MX5, and the Abarth nameplate does somehow also carry a bit of "euro" in the US,a nd sports credentials in Europe, so might attract similar customers, so might get cross shopped: ALso I doubt that the larger and heavier Z4 will be much quicker unless you choose the most powerful engine, and even then the Abarth might feel quicker, given it's character and sound. Last edited by mick78; 08-13-2018 at 01:22 PM. Porsche should do a new 914 by mounting the GTI's engine/transaxle midship for $30K base. THAT would fly out of the dealers relatively speaking. While it would be great for all those who want a Porsche, but cannot afford one - from the business perspective it would be the dumbest decision they could make right now. Technically, the Boxster is pretty much the same, expect it's turbo 4 cylinder is a Boxer engine, and thus bespoke to Porsche, but I doubt that inserting a GTI engine would make it considerably cheaper to produce (I'm pretty sure the 4 and 6 cylinder Porsche engines are very closely related). And it's also not like a base Boxster is so loaded with equipment that you could leave out much stuff, unless they manage to call it a GT something (in which case, Porsche customers are more than happy to spend money on equipment left out of the car). If they sold it cheaper, it would mostly be by cutting their excellent margins, so more a political decision (and I doubt Porsche would go this route). And for only a few thousand USD/EUR less, would you choose a Porsche with a VW engine over one with a Porsche engine? Especially in a sports car, and not a SUV? You missed the point by a thousand miles. I said nothing about inserting the GTI engine in the Boxster. Last edited by swizzle; 08-14-2018 at 12:54 AM. I think you missed my post, I said the Boxster is a mid engined 4 cylinder Porsche, and not a large or heavy car, so it's hard to imagine that a significantly smaller car would A) happen, and B) be significantly cheaper to make, or in sale. The Boxster has no exotic materials or fancy base equipment that you can leave out for cost reduction when developing a 914, and a GTI engine won't save thousands in production cost. So even if it is say 2000 USD cheaper to produce (which I doubt it would be even so much), Porsche would certainly not sell that for 30k, given how they love their margins; Remember how Porsche makes you pay for not equipping special 911s with AC, a stereo or sound deadening? 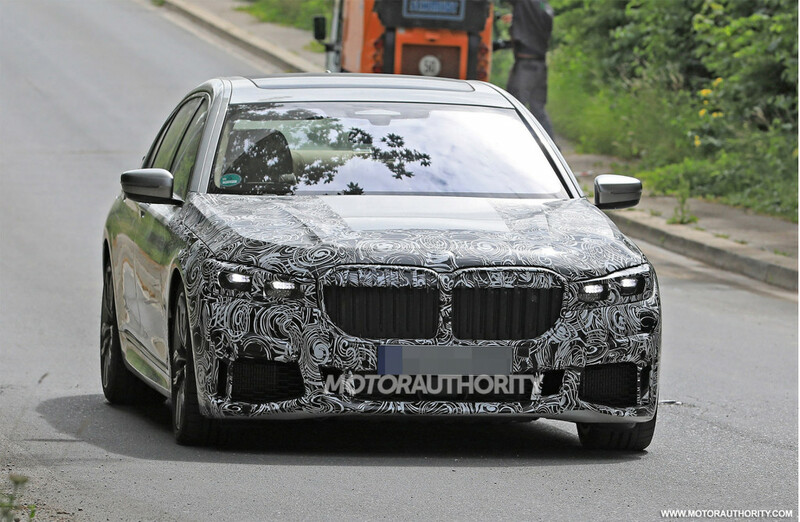 leaked, with the X5, 8 series, X7, and 7 series facelift all receiving the joined grill, why would they opt for a grill that is separated? not a fan of these wierdo press photos.